These were made as a thank you, to be given away. 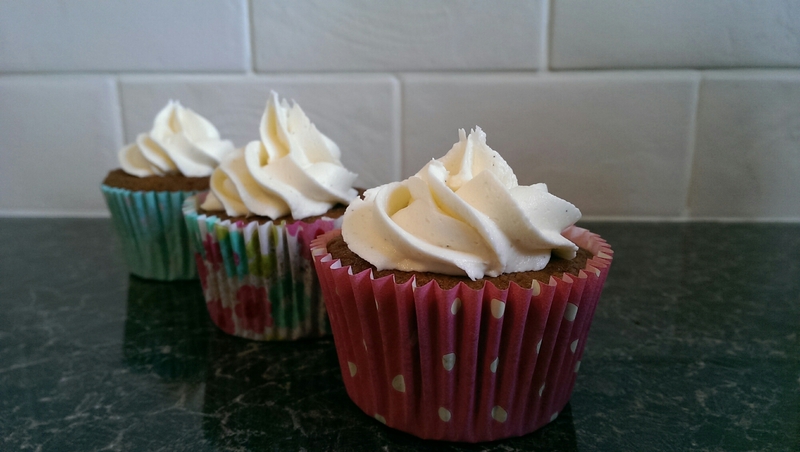 However, I am incapable of being truly altruistic so not only did I make cakes to a recipe that appealed to my cake-tastes, I kept a couple back, for testing purposes of course! The recipient may (or may not) read this blog but if they do, I think that they’d be pleased to know that I kept some back to test and thoroughly enjoyed eating them! Anyway, I adapted the recipe from this one on the Lakeland website (it may become apparent in a future post as to why I was on the Lakeland website for inspiration…). The recipe makes 24 and I didn’t think that myself and the recipient could get through quite that many so the recipe amounts below are essentially half of the stated ingredients but with a couple of minor alterations. I was intending to do the orange flavoured icing as stated but have mislaid my orange essence so went with vanilla bean paste, full of tiny little seeds and packed with vanilla flavour. It was a good choice. For the buttercream: Cream 75g soft butter with 150g icing sugar, a tsp of vanilla paste and a little hot water to loosen if necessary. – Preheat the oven to 180C (just noticed that the recipe states 150C, well I used 180!). Line a muffin tin with 12 liners. – Cream the butter and sugar until light and fluffy. Add the syrup and mix well. – Add the milk, egg, flour, ground ginger and bicarb and beat until well combined and light in texture. – Divide between the cases and bake for around 20-25 minutes until risen and golden. The syrup seems to make them colour quite quickly. When cool, pipe on the buttercream icing and enjoy. These were much, much lighter than I was expecting. For some reason I always think of cakes made with syrup being quite heavy and moist but these had a beautiful light, airy texture yet were still moist. The unmistakeable flavour of golden syrup came through well, and combined with the ginger to make these very enjoyable. I think they’ll also be good with custard for dessert and that will hopefully be the fate of the one which didn’t get any buttercream and is currently in the freezer. 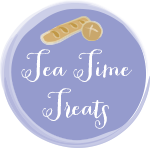 I’m entering this into a couple of blog challenges: Tea Time Treats, hosted this month by Karen of Lavender and Lovage (and on alternate months by Janie at The Hedgecombers). The theme this month is Muffins, Fairy Cakes and Cupcakes. These fit in perfectly. 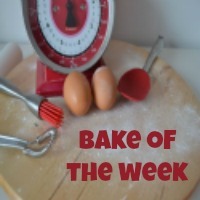 I’m also entering it into Bake of the Week, hosted by Casa Costello.